The rematch, like the first match, was no match. Cass Tech High’s speed-laden array of big-time players made all the big plays Saturday in the Michigan High School Athletic Association Division 1 football championship game to the point that Novi Detroit Catholic Central never really stood a chance. Coach Thomas Wilcher’s Technicians, who last year stunned the same opponent 49-13 to become the first Detroit Public School League team to win the MHSAA Division 1 state football championship, are collectively the PSL Proud Strong Learners of the Week after beating the Shamrocks again at Ford Field, this time by a score of 36-21, to capture the first back-to-back state championship in PSL football history. 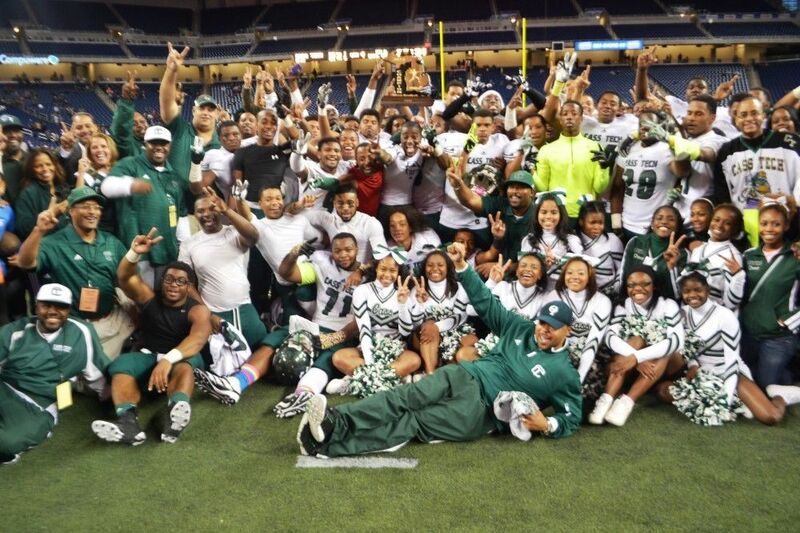 Cass Tech’s feat displayed the talents and determination of one team, but demonstrated that the Detroit Public School League has “a lot of great players and is a league to be reckoned with,’’ Wilcher said. Flanked in the post-game interview by his star senior wide receiver Jourdan Lewis and his sensational sophomore tandem of quarterback Jayru Campbell and running back Mike Weber, Wilcher told reporters that the Technicians’ repeat championship played out just like they scripted it. The fans had barely settled into their seats before Cass Tech’s thousands of partisans were in a screaming, celebratory frenzy. The Technicians continued to stoke the excitement with one spectacular play after another. Campbell hooked up with Lewis to score on Cass Tech’s first play from scrimmage. The play was supposed to be a short pass but Catholic Central’s defense was overplaying. The Technicians made them pay for it as Lewis nabbed Campbell’s perfect throw over two defenders and raced down the sidelines for an 89-yard TD. In the end, Cass Tech scored three TDs of 58 yards or longer and its defense forced five Catholic Central turnovers. Not long after, Cass Tech’s Kenton Gibbs recovered a fumble and returned it 58 yards for another TD, giving the Technicians a 12-0 lead with 7:25 remaining in the first quarter. Ken Snapp’s 31-yard field goal enabled Cass Tech to take a 15-7 lead into halftime. In the third quarter, Weber busted loose for a 57-yard gain and Deon Drake’s 30-yard TD run finished the four-play drive to make the score 22-7. In the fourth quarter, Campbell scored on a three-yarder to culminate a 16-play, 79-yard drive that hiked the lead to 29-7 with 7:59 remaining. Delano Hill’s 84-yard interception return and Snapp’s third extra-point kick finished the Technicians’ scoring and extended their lead to 36-13 with 1:06 to go. For the second year in a row, the Technicians’ began their state championship game day with players, coaches, students, faculty and fans walking the 1½- mile route from the school to Ford Field. When the team took the field, it was greeted by rousing cheers from thousands of supporters. And show they did. In completing a back-to-back state championship season with a 12-2 record, Cass Tech rattled off successive playoff victories against Grosse Pointe South 37-3, Dearborn 42-23, Saline 21-14, Lake Orion 34-27, and punctuated the journey by soundly averting Catholic Central’s hopes to avenge last year’s lopsided defeat. When the battle was won, Wilcher chose to share the post-game podium with Lewis, one of 16 Cass Tech seniors who will be receiving four-year football scholarships, and sophomores Weber and Campbell, who are among 40 varsity returnees next season, which virtually assures the Technicians’ status as a state powerhouse will continue.